Who benefits from accessible media? What is Accessible Education Material (AEM) and Accessible Media? AEM is “print and technology-based education materials designed to be usable across the widest range of individual variability”. Accessible media is media that has been designed to be available and accessible to a wide range of individuals of varying abilities. Media refers to various means of communicating or conveying information and includes mass media such as television, film, newspapers, or the radio. Physical and cognitive differences can affect access to or comprehension of information presented in different types of media. For example, individuals who have experienced vision loss or blindness may have difficulty with information that is only presented visually, whereas those who are deaf or hard of hearing may have difficulty with information that is conveyed through dialogue or another auditory form. Accessible media takes advantage of different technologies and devices to provide better access to a wide range of individuals and ensure that information is presented in a more inclusive manner. The goal would be to use or design educational materials that are accessible by design to ensure that materials and media are accessible to the widest range of individuals. Adapting existing materials may be necessary at times but it is important to keep in mind the adaptation must be equitable to the original content. For example, a printed handout that requires scribed responses should be available as a digitally interactive document. To further explain the equity of the two formats: if the printed handout has graphic organizers, visual prompts such as horizontal lines to indicate where to scribe answers and line drawings of objects then the digital form should include all of these elements. Why is Accessible Education Material and Media so Important? Accessibility includes access to buildings, roads, transportation and other physical structures, but also equal access to media and information for everyone, whether or not they have a disability. 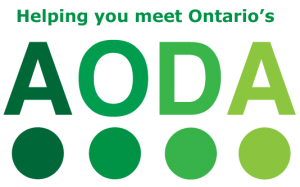 As part of the Accessibility for Ontarians with Disabilities Act (AODA), the “Information and Communication Standards” section outlines that information and communications should be provided in accessible formats whenever possible. 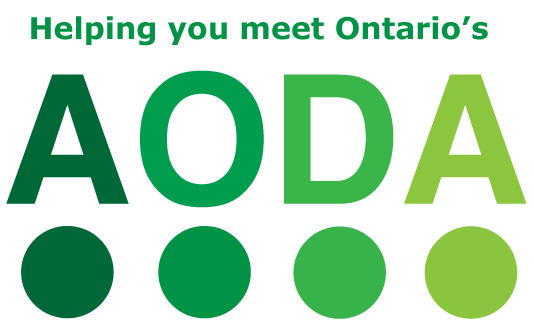 Under this section of the AODA, educational institutions must also provide academic resources in accessible formats whenever possible. Thus when media is incorporated into classroom or academic learning, providing media that is accessible for all students is essential. With rapid advances in technology and how students are obtaining information, educators are being challenged to incorporate more high technology and digital resources into courses. Accessible media can be used as an innovative tool, not only to engage students in interesting ways but also to change the approach to lesson planning and create a more inclusive learning environment. For example, students with low vision/blindness or those who are deaf/hard of hearing can benefit much more when described or captioned media are used as teaching aids. Accessible media not only improves access to education among students with a disability but can also benefit students who speak English as a second language. Additionally, younger children or individuals learning to read, exposure to certain types of accessible media at home or in school can also help in developing reading readiness. Who benefits from accessible media? – Describes how various individuals benefit from accessible media in an educational context. How to create accessible media – Presents tips and guidelines for creating various types of accessible media and useful resources. Text simplification guidelines – A strategy that involves making changes and adding to an existing text in order to make it more clear and comprehensible for all students. Resources on simplifying educational content – an alphabetical list of resources. Have any resources you’ve used? Designed any resources that are helpful? Share them with SNOW! Contact us at snow@ocadu.ca or through our contact page. Accessible media refers to the ways in which media information is communicated other than through standard media (e.g. captions, descriptions, transcripts). Learning about who uses accessible media and how these are used assists educators with using inclusive approaches to teach, communicate, and share information. People interact, learn, and communicate in diverse ways. Learning opportunities are increased when flexible ways of engaging with learning materials are provided. Considering how people communicate is important for knowledge to be exchanged. Accessible media takes into account diverse ways of exchanging information. The AODA legislates that educational institutions and their employees know how to produce accessible or conversion ready versions of textbooks and printed material. Educators, teachers, and staff are to learn about accessible program or course delivery and instruction and be knowledgeable at interacting and communicating with people with disabilities who may use alternate formats. Content in the Accessible Media section was created at the Inclusive Design Research Centre (IDRC) with the support of Accessible Media Incorporated (AMI). Accessible Media Inc. (AMI) is a not-for-profit multimedia organization operating two broadcast services, VoicePrint and The Accessible Channel—TACtv, and a companion website (ami.ca). AMI serves more than five million Canadians who are blind, deaf, vision, hearing or mobility impaired, learning disabled, print-restricted or learning English as a second language by making print, broadcast and online media accessible. Robert Pearson, former Accessibility Officer of Accessible Media Inc. provided expertise and content for the Accessible Media section on the SNOW site.